Not long ago much of what is now Gilbert, Arizona was devoted to the cultivation of Citrus, Cotton and Cattle. With industry and jobs and the ever expanding metropolis of Phoenix the fields have given way to neighborhood after neighborhood of residential homes. Tens of thousands of people generate millions of gallons of wastewater - which, thanks to modern treatment techniques can be made pure enough to drink. Citizens are still averse to using wastewater for direct human use, but have learned that it is a resource beyond value in this arid desert. The Riparian Preserve at Water Ranch has an urban fishing lake and seven shallow ponds where reclaimed water undergoes final purification by the workings of marsh plants, micoorganisms and solar energy. Part of the water infiltrates the soil to recharge the ground water, but before it does it is available as well to wildlife. Walking paths between the ponds have been discovered by strollers, bird watchers, equestrians, and folks walking their pets as a bit of verdant paradise amid the concrete of urbanscapes. The Gilbert planners whose vision produced this resource from ‘waste water’ and a quarter section of untaxed land should be commended. 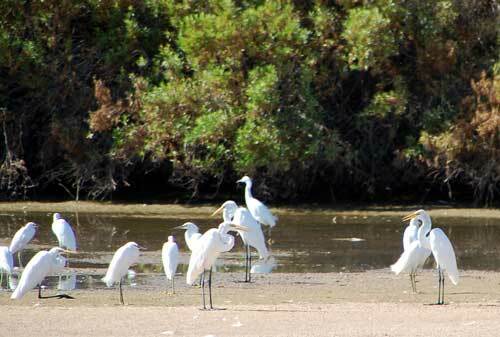 With so many fish to eat a gathering of herons and egrets relax afterwards on a mud bank. In this picture there are both Great Egrets (the taller ones) and Snowy Egrets. From Phoenix drive east on I-10 to US-60, the Superstition Freeway. Exit at Greenfield Rd. in Mesa and drive south about 3 miles to Guadalupe. The water ranch is on the southeast corner behind public library. The parking entrance is off Guadalupe just east of the library. Management of the area is by the Riparian Institute, a function of the City of Gilbert. It was an oppressively hot and muggy Sunday morning and yet dozens of bird watchers arrived early lugging heavy tripods, long telephoto lenses, binoculars and supplies of cold drinking water. Their quest: to take a look at a juvenile Wood Stork that had arrived and decided to stay a while about 10 days earlier. Word had been passed around via Listserves on the Internet that this magnificent bird, rarely seen in Arizona, was making a show. And there it was, on Pond #6, using its oversized bill to scoop up mini-tilapia fish alternately holding a wing out to shield the bright sunshine and making the water surface more transparent. Wonderful. Observers scarcely noticed the rivulets of perspiration dripping off their faces into the marsh. 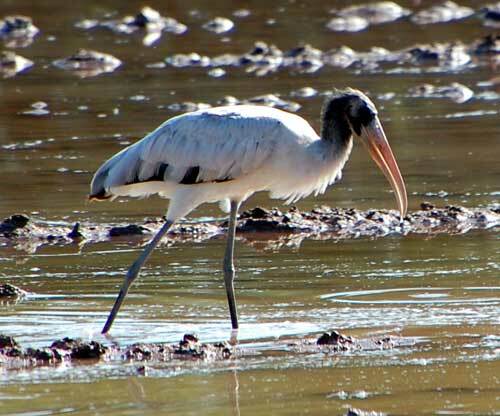 Plumage and other traits identified this Wood Stork as a first-year juvenile. Lucky it found this pond as it dispersed too far from its likely nesting spot in northwest Mexico. Many desert and riparian plants have been planted and tended at the Water Ranch and many are labled with common or Latin names. Thus a cousin to the Desert Botanical Garden is growing here! Alkali Goldenbush -- Isocoma acradenia -- loaded with goldenrod-like flowers from Sept. to Oct.
Fremont Thorn Bush -- Lycium fremontii - flowers visited by hummingbirds and abundant red berries eaten by many birds. 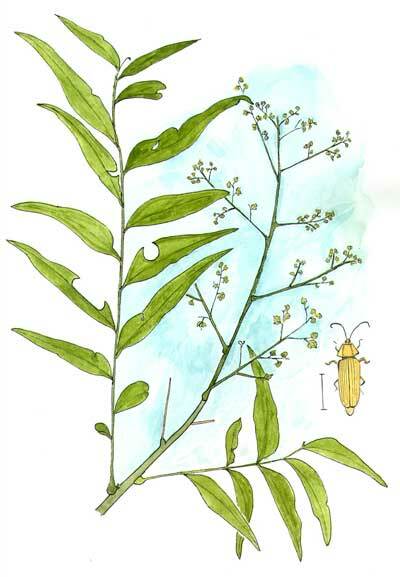 Watercolor of Western Soapberry, Sapindus saponaria, from live specimen found in the Pinal Co., Arizona. Lycid beetles, one illustrated at right, are one group of insects likely to be encountered on the flowers. In addition the leaf shows round and oblong segments cut out by leaf-cutter bees.